Father Gaudreau was ordained to the priesthood on September 28, 1975 by the Most Reverend John A. Marshall. His first assignments as a priest were at Holy Family Parish in Essex Junction (1975-1978) and St. Joseph Parish in Burlington (1978-1983). From 1983 to 1989 he served the Diocese as Director of the Liturgical Development Program. 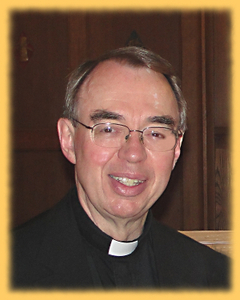 He has been pastor at St. Ann Church in Milton and Ascension Church in Georgia (1989-1995), St. Augustine in Montpelier (1995-1997) and Blessed Sacrament in Stowe (1997 to 2005) while also serving as Diocesan Director of the Permanent Diaconate and Lay Ministry Program. Since 2005 he has been the pastor of St. John Vianney Church, South Burlington.